Home News McGinley Ponders If McIlroy Can Successfully ‘Reinvent’ Himself In Turning 30. McGinley Ponders If McIlroy Can Successfully ‘Reinvent’ Himself In Turning 30. 3 months ago by Bernie McGuire Comments Off on McGinley Ponders If McIlroy Can Successfully ‘Reinvent’ Himself In Turning 30. One of golf’s more highly-respective obersevers of the game ask the question if Rory McIlroy can successfully ‘reinvent’ himself once he turns 30. Paul McGinley knows McIlroy and he knows McIlroy’s golf game better than anyone. But the 2014 victorious European Ryder Cup captain and much-revered SKY Sports TV pundit is firstly concerned McIlroy is making far too many mistakes over the course of a Sunday final round. We’ve seen it far too often in recent years with McIlroy out in the last match on a Sunday, ala 2017 Dubai Desert Classic, 2018 Masters, 2018 Tour Championship and most-recently in the 2019 Sentry Tournament of Champions snatching defeat from the jaws of victory. Indeed, McIlroy has been in the last group on no fewer than eight occasions this past 12 months. 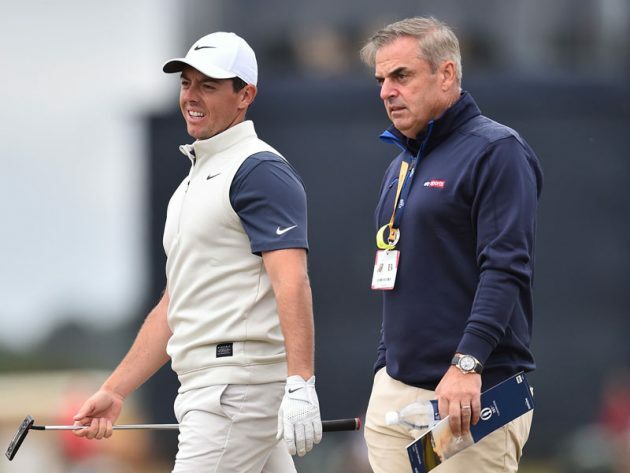 Paul McGinley ponders if Rory McIlroy can successfully reinvent himself once turning 30. “He’s making mistakes on Sundays he wouldn’t normally make if he was fully confident. But I saw a lot of him during the season opener in Hawaii recently, and liked what I saw. ‘I think it makes perfect sense to stay in America given what’s at stake when he gets to Augusta,’ said McGinley. ‘I know some people think he’s fallen behind the likes of Brooks Koepka and Justin Thomas, but if he wins the Masters he puts himself on a completely different level. “That’s what the great players have done. Look at Tiger Woods. “Can Rory find a way back to those days in the final round when he would have a walk of destiny right from the start? “We know he’s got the right stuff inside, but can he bring it out again? I’m hopeful, I must say. “As for his comments regarding the European I didn’t understand why he said it, to be honest. “We can all see that America is the place to be if you’re a top 20 player in the world. Why wouldn’t you want to play there, with three of the four majors there and everything else? “I thought it was incredibly harsh but we don’t want to fall out with him. We all know him and like him, and he’s an important part of our tour. I know people keep saying there must be an agenda but if there is, I don’t know about it. McIlroy returns to competiton at this week’s Farmers Insurance Open where he is making his debut appearance along the stunning clifftop course overlooking the Pacific Ocean. And after the disappointment of Hawaii, McIlroy gets another opportunity to begin the New Year with a victory and something he has not achieved since capturing a second Dubai Desert Classic in 2015.